Another year goes by, another pile of miniatures bought, some even painted. As is traditional, I have been looking through my blog for the year, it's a useful reminder of the highs and lows of 2010. The high of the year for me has been the expansion of my painted armies, with my chaos, dwarfs and orcs and goblins armies all reaching around the 2000 point mark. Additionally, I have two 1000 point armies in wood elves and daemons, useful starting points for expansion. These are likely to be the areas that will get the most attention in 2011, though I do have plans for another army. More on that in the new year. From a hobby perspective, I guess the year was a big one with the release of 8th edition. It certainly seemed to ruffle many a forum feather. From a personal viewpoint, it's had little effect on my collection, having always been a fan of basic core infantry. The main impact has been on my ogre-sized units, which I now collect in blocks of 4 or 6 rather than 3. Other than that, it's been business as usual for my army building exercises. In gaming terms, I think I am enjoying 8th more than 7th, the game has improved in more areas than it has declined, so on the whole I am enjoying the game. The end of year event was fought yesterday - a 3000 point battle featuring two fully painted armies! The combined forces of chaos warriors and daemons fought against the massed infantry ranks of the Empire. It was a fine spectacle to behold, though I was unable to get any decent photos. It made me think how much more I enjoy the game when using painted figures. I did reflect on the rather haphazard nature of the growth of my chaos army, something I am hoping to address in the new year. For those who remember such things, I will be redesigning my army around the champion/retinue system. More on that in the coming months. After a brief break from the hobby in the past couple of months, I am feeling the urge to pick up the glue and brushes again. Happy New Year indeed! 10 reasons why I might start an Ostermark army. 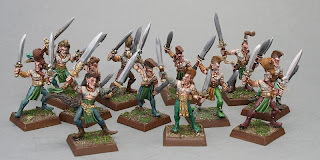 When I started this blog one of the main purposes was to log my progress on my armies and painting projects. Most of my posts do just that. Another reason for the blog was to jot down any thoughts I was having at the time. Often these thoughts will be fairly random and short-lived, but occasionally they will develop into something a bit more substantial and with the potential of actually developing into something concrete (or should that be plastic). This post is one of these, a series of ideas and musing that has developed in my head over the past few days and now I just can't seem to get rid of it. If I write it all down, I may be able to forget if for a while and come back to it later. So here are 10 reasons why I might start an Ostermark army. 1. Ostermark is a rural region in the north of the Empire, bordered to the north by Kislev. It is often subject to raids by chaos marauders and the like. Meanwhile, in the real world, I live in Cumbria, a rural county in the north of England, bordered to the north by Scotland. The lands around the border were contested by the Scots and Cumbrians for centuries (the region was known as "the Debatable Lands"), and raids by reivers were common. 2. The largest city in Cumbria is Carlisle, the Border City. It contains a fine castle and remains of a stout town wall. The wall gates were originally guarded by two huge bastions known as the Citadel. 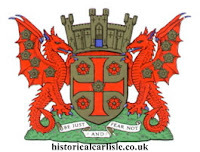 The coat of arms for the city (shown above) contains a red wyvern, which matches the red beast shown as the symbol of Ostermark (there's a picture of this in the Uniforms and Heraldry of the Empire book). 3. The colours of the state troops in Ostermark are purple/burgundy and yellow/white. This would make a striking army different to the usual red/blue garbed soldiers. 4. One famous regiment to originate in Ostermark are the Deaths Heads, masked warriors bearing halberds and wearing red and black uniforms rather then the typical purple and white. 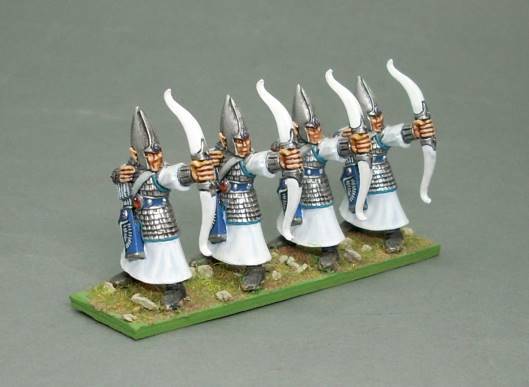 These would make an interesting modelling and painting project and add some real character to the army. 5. Life is tough in Ostermark and the locals are hardy folk, though not particularly well equipped. This suggests to me a preponderance of spearmen, archers, crossbows and hunters, rather than blackpowder armed troops. However, garrisons at the border would be well equipped, so the army would not be just a bunch of peasants and farmers! Not only would this make for a characterful army, but it just happens to match most of the figures in my current collection. 6. I often fight against chaos armies, so there is plenty of opportunity to develop a scenario based campaign around these two armies. 7. 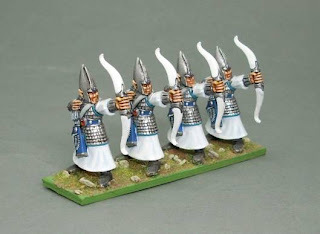 Because of the proximity of the border with chaos (Kislev) and the Vampire Counts (nearby Sylvania), there is a strong opportunity to include a witch hunter theme in some of the regiments. 8. There is a suggestion is some of the background material that ogres are quite common in Ostermark. 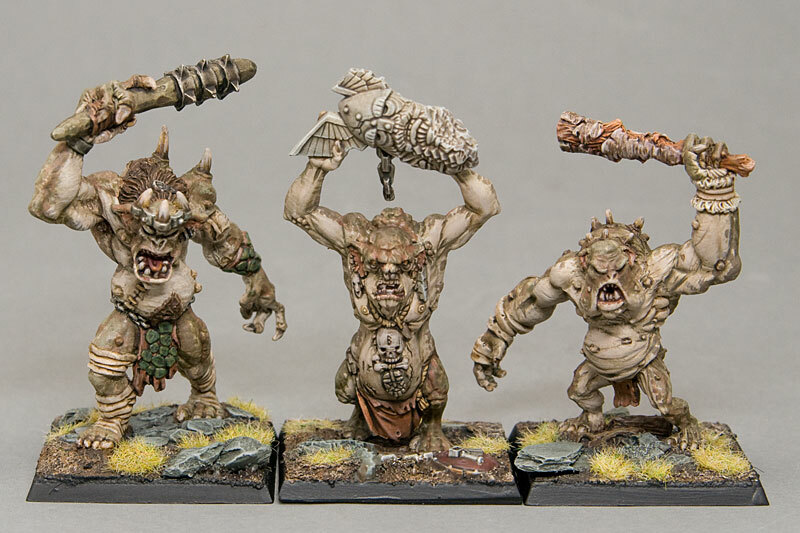 I could include ogres as allies or unit fillers. 9. Similarly, there is a suggestion that dwarf slayers often roam into Ostermark from nearby Karak Kadrin, obviously seeking out undead or chaos monsters to slay. One of my other armies is dwarfs, which desperately need some shaven-headed berserk troops. 10. There is a long-term project that could develop, incorporating units from both Ostermark and Ostland, probably my two favourite Empire provinces. Now that I have that off my chest, perhaps I can get back to real painting instead of head in the clouds dreaming! Christmas is coming, the goose is getting fat, please don't step on the frog, or something like that, I never was one for carols. This little chap represents a big part in my warhammer world. 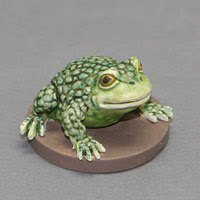 He's the toad from the Talisman board game. It was the first game I ever bought from Games Workshop, back in the 1980's. Me and my brothers and friends would play for hours, first with the original set and then later with all the expansions added on. Good times. Eventually I progressed into other boardgames such as Heroquest and from there it was perhaps inevitable that I would take up Warhammer. Once the switch was made from boardgame to wargame, my old set of Talisman languished in the cupboard for many years. A few years ago I was surprised at how valuable they were to collectors and sold it on ebay, making a tidy sum, though with a hint of regret. Recently, the game was re-released by the Black Library and I bought it in a nostalgic moment.The game was subsequently taken on by Fantasy Flight games, who have released a number of expansions. And that's where this little chap comes in. He is part of the FFG version of the game, which includes plastic figures rather than cardboard pieces. I painted him up very quickly and will eventually get round to all the characters. How does this relate to Christmas? It's the one time of the year I can persuade my rapidly growing teenagers to gather round the table for a board game, and Talisman is the one we always seem to come back to (that and Cluedo). So this year I am hoping to surprise my family with these new additions to the game. It's become as much a part of Christmas as turkey, tinsel and TV! 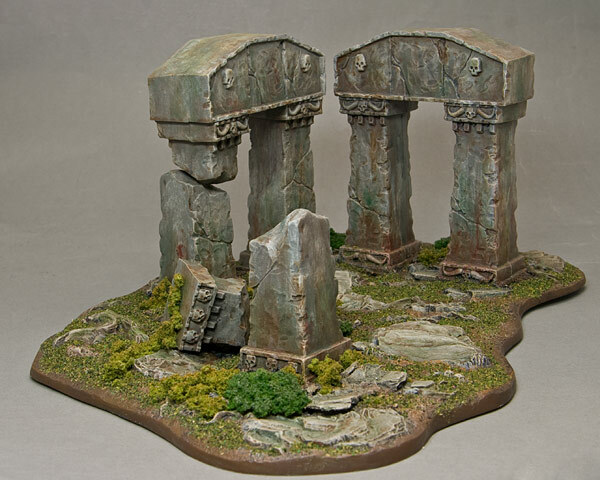 I am slowly building up my terrain collection, with this set of arcane ruins the latest addition. As you can see, I have mounted it on the base piece that comes with the Citadel Wood. One of the trees is currently sat in a swamp, the other two are still be used in other projects I have in mind. The remainder of the ruins set I will use as an altar with a removable monolith, hopefully this will give me some variety/choice. The painting is mostly washes and glazes over a light grey colour, with little bits of drybrushing here and there. 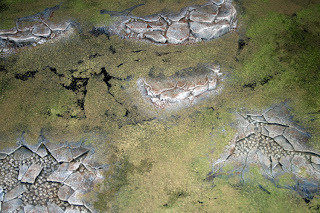 The ground is covered with woodland scenics flock and foliage. This was done to tie it into the bases of my daemon army, after all it's quite likely that they would be attracted to magic infused places like this one. 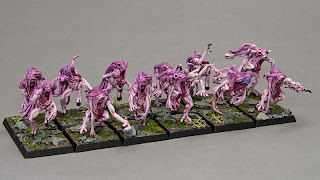 I picked up a dozen pink horrors recently on ebay, but when they arrived I realised that some of the metal arms were missing. A quick search in my pile of unpainted figures and I found some ghoul arms. I also added some twisted tree roots from the wood elf sprues. I like the slightly more mutated result on a few of the models. I don't know if 12 is a good number for a unit of horrors, it just happened to be the number I had available. I do have another 10 that I painted some years ago, which I might add to this unit. But I think first I should try them out in two smaller units and see how they get on. It's interesting to see the difference in painting styles of the two units. The older unit I painted by layering and blending. It gives a very smooth look, but is quite time consuming. The newer unit was speed painted, mostly glazing and stippling in quite a loose manner. It's difficult to compare the two because of the different colours, but I definitely like the time savings involved in my current technique. It allows me to paint more models! A bit of a contrast from the teeny tiny nurglings of the previous post, this shaggoth is a model that I have had "in progress" for a long while. For several years I have had the old dragon rear half and the body of a minotaur lord glued together. It's only in the past month that I finally picked up the gauntlet, adding the chaos spawn smaller arms and the bloodthirster head to complete the model (well, some fairly rudimentary greenstuff work was required too). I like the dynamic, aggressive pose that results from all those chunks of metal. When it came to the colours, I was initially tempted to paint a dark colour scheme, possibly even a black hide. But I decided that it was a chance to add some colour to a mostly metallic army, so I went for this green hide instead. I think it works reasonably well with the flesh tones, though I can't help thinking that a dark red might have been a better choice. Then again, the splashes of red gore on the model stand out more against the green scales. I guess I am undecided! Now that I have finished this brute, I am keen to paint up some more chaos units to add to the Warriors of Chaos army. I have some marauder horse that have been assembled but unpainted for around two years, so I should really get those done. I also have a fair few marauders that I would like to try out some ideas on, which would add some numbers to the army. 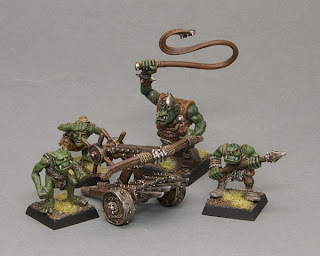 But possibly most tempting of all are some lovely old metal ogres that I have patiently collected from ebay. Which should I choose? The daemon army has come to a minor halt this last couple of weeks as I turn my attentions to a couple of other projects. However, I am determined to add at least one regiment per month. For this particular month I can smugly claim to have two regiments. Nurglings are pretty easy to paint up, so adding six bases to the army and calling them two regiments is maybe a bit of a cheat. But I do actually intend to use both regiments. They scout, so can take up advanced positions in deployment and hopefully threaten artillery, small units of shooters, enemy scouts and the like. Daemon armies seem very fragile to my eye (though I have never actually fought with or against them as yet), so I am a bit obsessed about countering artillery and shooting. Keen eyed observers will have noticed that these little bands of mischief makers contain a few surprises, in that some of the models are not nurglings. A quick scrabble through my bitz box and I found a few old familiars that helped to add a little variety to the mix. Here's something you don't see very often; an old Warzone figure I picked up from a sale bin about ten years ago. I knew it would be useful at some stage. I chopped off it's rather clunky arm and replaced it with a plastic daemonette claw, trimmed down the badly sculpted loin cloth to a more fashionable mini skirt and painted it up to match the daemonettes. It's stood on a 25mm base to act as a herald in that unit, though it's not a very good fit, all those arms/claws get in the way. My time on the army has been limited in the past few weeks, though I have also managed to churn out a few nurgling bases. I will post pictures of them in the next couple of days. Oh dear, I seem to have started another army. But wait, this is one army that I really think I can finish in a matter of months rather than years. Daemons are high points cost, so the number of models per army is low, typically well below 100 for an army of 2000 points. So that's one reason. I also have the models already, so I won't have to hunt round for bargains. But the main reason is that these are some of the few models my wife actually likes and she said that if she could ever be persuaded to play, it would have to be these models. And as we all know, "yes dear" solves 90% of all problems so daemons it is, for the next few months at any rate. This unit of 18 daemonettes will be added to 10 horrors, 5 screamers and a Tzeentch herald I already have painted from a few years back. That's over 500 points to get me well on the way. I will probably concentrate on the Slaanesh regiments to start with, to get some smaller games started with my new pupil. Ultimately I would like to use the army myself and would like it to contain one core unit from each of the deities, but that's not a short term prospect. For the time being, it will be mostly Slaanesh, with a reasonable slice of Tzeentch and a smattering of the other two. I completed painting the two spear chukkas over the past few days. The chukkas themselves I cannot remember where they came from, even if they are orc and goblin models, but they sure look like it. If not then they have obviously been looted from a defeated foe. The crew are a variety of old models, while the orc bully is made from plastic bits. A pair of chukkas can often cause the enemy problems, especially if I place them on the flanks. Though they are not the best marksmen, there's usually a 1 in 3 chance of hitting the target, so they can be very effective, especially if they manage to take out heavily armoured units like knights. The enemy have to come out to deal with them, so at just 40 points per chukka they are a real steal and are always my first special choice. Having said that in the last game they did absolutely nothing, not helped by their crews rushing forwards under the influence of a first turn Waaargh spell! The second chukka crew is made up from plastics bits from the goblin sprues. Notice that two of them are having a squabble so the bully is rushing over to sort them out. He's getting on a bit so uses an iron bar as a walking stick. I did wonder if I should embellish it with a severed goblin head, just to "show them snotty little crew wot 'appens if they muck about." I took the newly painted orc unit along to a campaign game last night. The Empire troops were manning the barricades in the hastily fortified village of Averheim, while the orcs streamed on from two sides to sack and pillage. The orc boyz got a lucky 6 roll for animosity and stormed forward, almost to the barricades. The Empire general sent his army champion (standard bearer) with a unit of halberdiers to counter the threat. The orc boyz stood up to this charge and hacked down a few humans in return, winning the combat and sending the humans racing back in to the village square to "regroup". The orcs then quickly despatched a detachment of militia before slamming into the flank of a unit of swordsmen. Freshly painted and in the thick of the action, a gaming geek's dream. Things were going quite smoothly for the rest of the army too. A unit of spider riders managed to disable a hellblaster before being hacked down by a unit of greatswords, a worthwhile exchange. A large unit of night goblins were in a grinding combat with a unit of flagellents, trolls were almost at the main gate of the village, while a unit of black orcs (with the help of the general's Waargh) had managed to charge a unit of Empire knights. The one minor setback was the giant stumbling as he tried to cross the fences, he would have to spend a turn getting up again and then try to cross the barrier again. Empire relief forces turned up but were hampered by night goblin fanatics or charged by rampaging black orcs, leaving the dwindling forces in the villages to fight on. A minor victory was scored by the Empire as they sent the trolls fleeing from the main gate, strength in numbers winning the combat. The orc boyz were charged in the flank by a unit of greatswords and it seemed that the balance of the game was going to swing back to the humans. Four hits were scored but incredibly four 1's turned up on the to wound rolls! Just like a White Dwarf report. Even so, it was still a desperate moment as the boyz needed a 4 to stay in the game - yep, the second amazing roll turned up trumps for the greenskins. They had survived the Empire counter attack and could now hack down swordsmen to the front and greatswords to the flank. When the giant finally managed to negotiate the fence and charged in to help, the casualty toll was too high for the Empire and they fled. The newly painted orcs suffered more than 50% casualties but racked up an impressive tally - the halberdiers' standard, a unit of militia, a unit of greatswords and a unit of swordsmen (with the help of a giant). What a debut, one that will be hard to beat. On my painting table at the moment is a couple of spear chukkas, then I will have to paint up some trolls and the giant. I was hoping to have them ready for the climax of the campaign, a siege at the Gates of Nuln, but I won't have the time for that. Still, I will try to remember to take my camera along for a final report. The Waaaargh gathers momentum, in the shape of 25 boyz with extra choppas. This unit can be quite useful in games, especially when led by a black orc who quells animosity and adds considerable punch (and I have a very nice model lined up for this role). In 8th edition I expect this unit to be even better, if it's true about both front ranks fighting the unit will be pumping out 20+ attacks. Not too shabby, especially in the first round when the choppas rule gives them additional strength. In terms of the painting they were very straight forward and I spent little time on them. There are some slight variations in the skin tones, which I figured would add a little much-needed variety to a unit that is mostly wearing brown clothing. The banner design is very simple but the bold colours really pop out against the drab tones. I have also finished painting an orc shamen (left). The one on the right is a Rackham Confrontation figure which I painted a few years ago. I think of him as a savage orc, both in appearance and in the difference in skin tone (there's no particular reason why bright green = savage, it just seems fitting in my mind). I need to repaint the base edge, just realised it's brown rather than black. I have some other non-GW figures to use as savage orcs, but they will take me some time to complete so are on the back burner for a while. Next on the list are trolls and a giant. That will add another 300 points or so to the army, my ambition to have 2000 points fully painted for the launch of 8th edition is looking good. One minor problem I have is with the new boar boyz. They are so much nicer then the old plastic boars that I am really tempted to bin my exisiting unit and get a box or three of the new plastics (for a unit of 10, steeds for 2 chariots and a character mount). The leftover boyz could be incorporated into a unit of biguns, which I have been pondering for a while. If I get that little lot painted up I reckon I would be closer to 3000 points. Not bad for an army that started life as a change of pace from my dwarfs! I am going through a Magnus Magnusson phase. He was the question master on the TV show Mastermind and if the end of round bleep sounded while he was in mid sentence of a question, he would say "I've started so I'll finish." This unit has been partially painted for a long time and is the first of a few I have in mind to finish prior to the release of 8th edition. One thing I was particularly pleased about was the banner. I am usually very hesitant to paint freehand as I'm not particularly proficient. 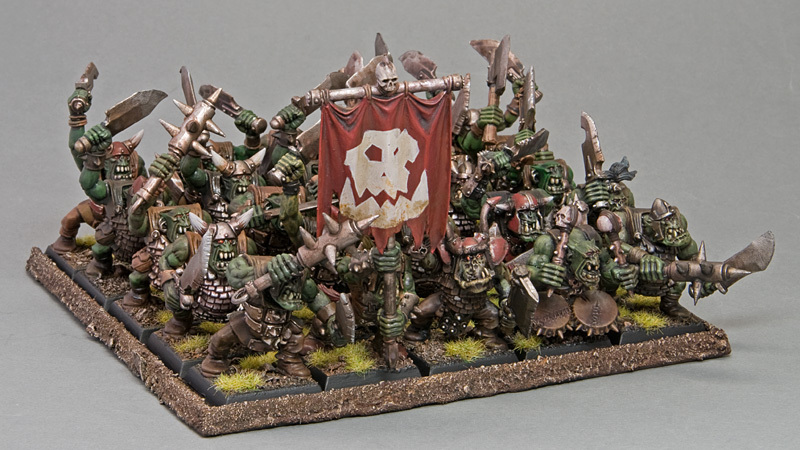 An orc design is about as basic as there can be so it's not a huge achievement, but it does look good in the unit. The horns of the skull I added to mirror the helmets of the boyz. Next on the Magnus list is a bigger unit of orc boyz, some of which isn't even primed yet, so plenty of work involved. I also have a couple of characters that are half painted, so lots more greenskins on the way. The elves finally get some serious hitting power. I cannot imagine a wood elf army without a treeman, he's an iconic element of the game. However, I was never a fan of the current model, I much preferred the Treebeard look from the Lord of the Rings range. 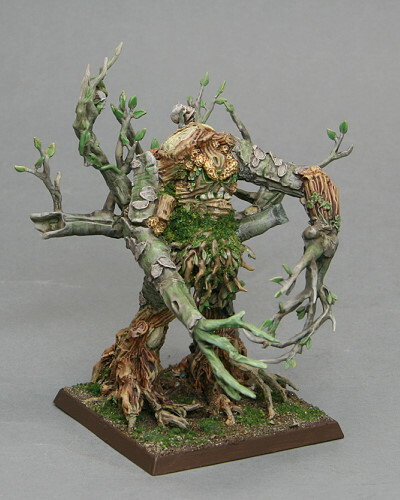 I could have bought the model and used that, but I already had an old style treeman and decided to use that as a starting point. 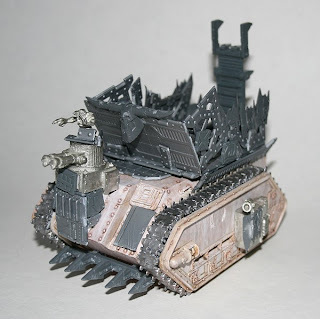 There's a thread on the Warhammer Forum showing in detail how I made the conversion. I will be taking a short break from the elves. I don't want to spend too much time building new units until I have a better idea of the implications of 8th edition. The forest sleeps for a few months! 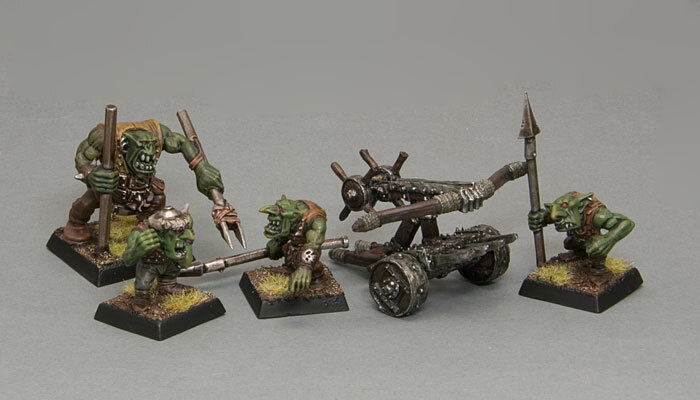 Next on my agenda is some greenskins, I have a couple of units that are half-painted that I would really like to complete before the new game is bought. I am also about half way through a mini campaign featuring the greenskins against the Empire, so it makes sense to get out the green paints. I'm feeling a bit confused about what to paint for myself next! Having painted elves for the past few months, plus a few goblins, I realised I was meandering through my fantasy armies. I think this is because I don't want to commit too much time to armies that I might have to alter when the new edition arrives. I don't really think this is the case, I suspect most of my armies will just carry on in the next version much as they do in the current one. But it seems to be a psychological block to starting something new. Which is why (as discussed in my previous post) I was intending to finish off a few units that I have already partially painted, or just assembled and never even primed. No new builds was my mantra, certainly no new purchases. But then I started work on a commission, painting some Space Wolves. The new plastic kits are really nice work. I can see there's a lot of potential for some characterful marine builds. I have never really been a big fan of marines, not the models, not the background, they just seem a bit dull to me. The Space Wolves are the one exception, because their heads are visible it's far easier to get some expression, some feeling out of each model. There's just one problem for me - duck egg blue! Is there anything less vikingesque than pale blue armour? It's just so pastel, so 1980's, so girly. Hence the attempt above (using the rather spiffy Bolter and Chainsword Space Marine Painter). It looks very plain, but of course there would be wolf skins, skulls, runes, etc. added to the model. 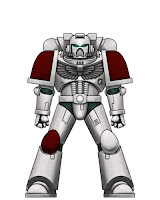 Perhaps I should dig out a marine from my old Macragge set, just to satisfy my curiosity. Some time ago I promised to upload better pictures of my chaos army, so here we are. I made good progress on the army at first, painting these warriors, some marauders, hounds, a spawn and a character or two. But then I put it to one side to paint orks. 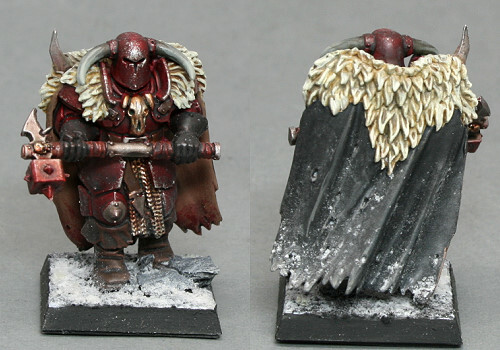 With the upcoming release of the new version of Warhammer Fantasy I am pondering what to paint next. I would really like to celebrate buying the new book by fielding a completely painted 2k army. The elves are leaving me a bit cold at the moment, so I need to take a rest from them. 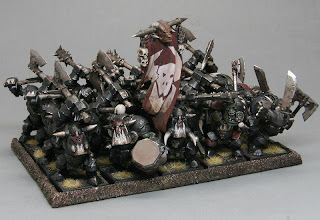 I have recently played my orcs and goblins a few times, and have a regiment of black orcs about 90% completed. But still I would have to add quite a few more models to reach the 2k mark. The dwarfs are probably the easiest, strictly speaking I have enough now, but it's not the army composition I would normally use. A regiment and a war machine would be an easy target. Finally, there's the chaos army. High points cost means low model count, the last time I looked at my list I think I needed just a couple of mounted regiments to get me to the 1.5k mark, so it wouldn't take much more effort from there. 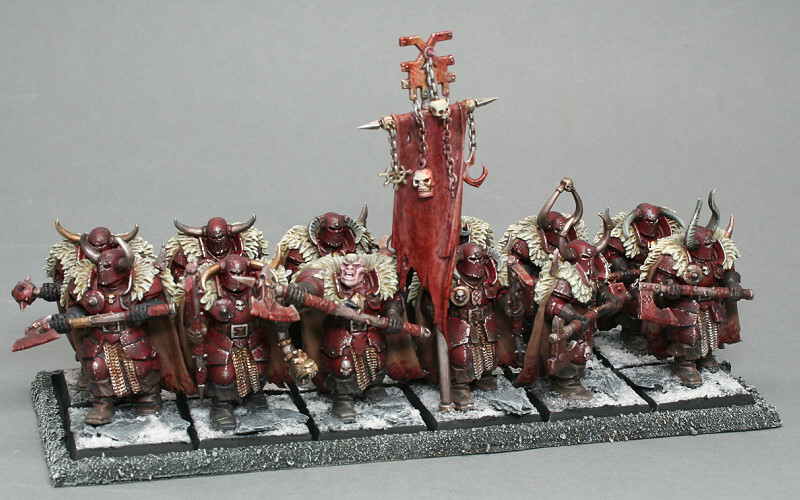 In fact, I did paint up an unmarked regiment of chaos warriors a few years ago, I could touch them up and re-base them quite easily. Something for the weekend then, play around with a few lists to see which I fancy painting the most. What can you do in a rainy long weekend? It's Easter, so there's not much on TV (hundreds of adverts for chocolate, films like the Sound of Music, and the interminably dull Grand Prix). Plenty of time for hobby then, so I thought I would finally take the plunge and paint up my gameboard. I bought it last year and sprayed it black in the garden one fine sunny day in October. Then the worst winter for 50 years happened and I have been waiting for fine weather ever since, thinking I would take it into the garage to minimise any mess. But still, the weather is cold and wintry, so I have decided to tackle it indoors. The first thing I did was the rocky outcrops, painting them grey and then a creamy highlight, then finishing them with some brown tinted antique washes. I'm using some cheap and cheerful art paints I picked up in a DIY shop bin end sale. The effect is really quite nice. Then the bit I had been most perplexed about, the grass and earth bits. I bought some Woodland Scenics Earth pigment to use as a base colour, but it's really disappointing and does not cover the black very well. Once it was on I scattered on Woodland Scenics turf, in various colours. I was then hoping to spray it with some diluted pva glue and water mix, but that didn't really work either. So the scatter is still very loose. The photo shows some patches that I missed, these are showing as black. This was a test run, I need to make some changes for the other tiles. The black needs to be fully covered with the antique washes, these go on very quickly and finish to a nice opaque finish. Then I will simply dab on pva glue, scatter the turf and allow to dry overnight. Then I will seal with diluted pva using a decorating paint brush for speed. With a little luck it will be finished over the Easter break, now that I know what I am doing. Spring has finally sprung here in the north of the UK. The frogs in the garden pond have been spawning day and night for about a week, I guess all that waiting for milder weather made them extra keen! I could see them from the kitchen window, hopping down the garden path to the pond, and the idea came to me to paint the squigs like frogs. With extra teeth, claws and horns of course. The large squig is from the Skarsnik set. I still have the special character model somewhere, to paint up at a later date and add to the base here, as the herder on the rock is magnetised. So at a future date I can field Skarsnik and his pet giant squig, or I can field the goblin model stand alone as a goblin shaman. There's a rumour circulating that plastic squig herds are on the way, possibly as early as this summer. If that's true and the models are nice enough (and reasonably priced enough) to buy, I can expand this unit or even start a new unit. Mixing the older and newer models in a unit such as this seems to reinforce the chaotic nature of the herd. 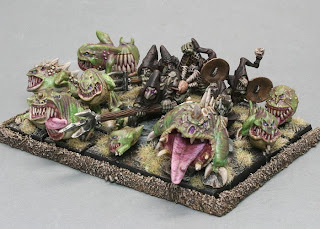 Or it might be posssible to take the new plastics and convert them to squig hoppers. We'll just have to wait and see. After fielding the orcs and goblins in a recent game, I realised that I had never got round to assembling boar boyz. I picked up some metal figures on ebay maybe a year ago, which I stripped this week. Add in a few plastic bits and the job was easier than I expected - I spent just a couple of hours bashing these together. Not sure why I waited so long, I guess there's always something else to spend hobby time on. I love the guy with the banner, with his hook for a hand. The boss has a trophy rack, just in case you are trying to make out the silver blob in the centre of the picture! I made a pledge to myself earlier in the year that I would stop buying stuff and try to make an impression on the piles of soldiers I already have. 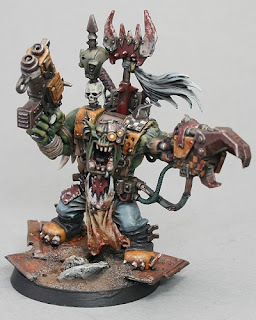 For a couple of months I held steady, but then GW released pictures of the Ork killa kans and I knew I would have to have them. But, I reassured myself, I can have them for my birthday later in the year, so that doesn't count, so I have stuck to my pledge. Then I made the mistake of browsing ebay. 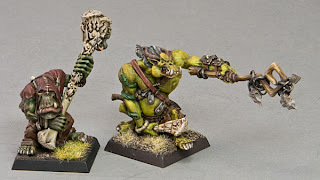 I spotted some lovely old ogre models that I have always liked and managed to snap them up. They have already been stripped and will most likely be allocated a place in the Chaos army, with maybe a couple of them making it to my Ogre Kingdoms army as maneaters. I convinced myself that this wasn't too bad of a slip, because I picked them up quite cheaply and they will be used in two armies. Then I made my second mistake. Though most of my collection is GW, I periodically take a look around all the mini manufacturer sites, just to see what else is going on. And I spotted something I really like. I never thought I would go for this particular thing, but they were just so nice. An idea started to form in my head. I would need a few extra bits, which I will have to pick up from ebay, but it should allow me to collect (yet another) army at a fairly low cost. I won't say what it is yet, just in case I come to my senses and abandon the project. I suppose after nearly twenty years of collecting, selling off, then re-collecting armies, I should have known better. But then, Monogarmy has never appealed to me! Another unit of glade guard added to the wood elf army. And I think I can use the term army now, it's starting to shape up quite nicely. 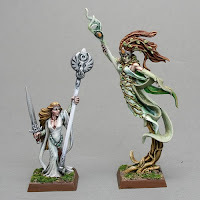 At the moment, it comprises 2 units each of glade guard and wardancers, a unit apiece of dryads and waywatchers/scouts and a single character in the spellsinger. That's about 750 points I reckon. Next to be painted will be 2 more units of dryads and a treeman. That will bump up the value considerably. After that, I have to decide if I want to add glade riders or convert them to wildriders. Add in another couple of characters and maybe one more unit of glade guard and the army will be complete. I played my first game with the wood elves last night, a 2k pitched battle against their arch enemies, the beastmen. I was a bit apprehensive about the army, it looked very small and weak compared to the big blocks of muscle and horn across the table. Things started quite badly with some abysmal dice in the shooting phase - 30 Glade Guard shots and just 4 chaos hounds dead. The next turn was similarly disappointing, my dice really letting me down - even the Hail of Doom Arrow failed to cause a single wound. I was starting to think that my pre-game thoughts on the power of shooting (or lack of) would turn out to be true. By turn 3 combat had started. Dryads were torn apart by minotaurs, but the doombull failed to make an impact on the wardancers thanks to their shadows coil dance. A second wardancer troupe led by a noble leapt in and sliced the mighty beast to pieces. The wardancers went on to rashly charge a full unit of bestigors in the front, thinking it was suicide, but caused massive casualties and eventually defeated them, with a little help from some dryads. Towards the end of the game the one surviving unit of glade guard finally found their aim, felling a giant and a tuskgor chariot. There were quite a few dead elves around, but even more beasts. A solid victory for the wood elves in their first outing. Looking back at the game, I played the elves reasonably well but was far too cautious. My treeman ancient spent most of the game hiding in a wood, worried about bestigor axes. The wild riders defeated a tuskgor chariot but then were defeated by a unit of bestigor, even though they managed to get the flank charge. I learned some lessons for my next game, was pleased with their debut but doubt they would have such an easy ride next time. 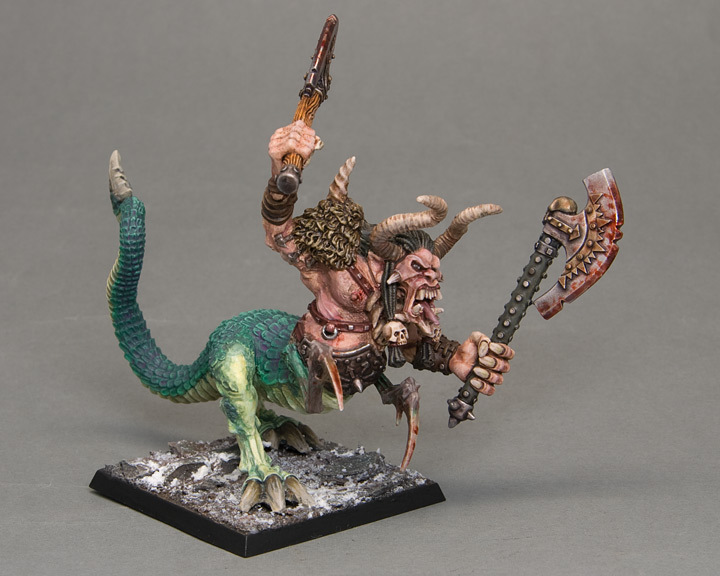 I'm still puzzled by the beastmen. The lack of skirmish troops really hurt them in this game, it was reasonably straight forward to neutralise the slow blocks, deal with the fast troops, then turn back to pick off the infantry units at leisure. Maybe I'm missing something, but they still look poor at the moment. Just a quick update. 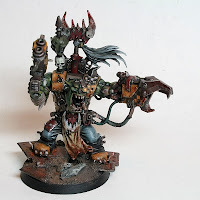 Most of my painting time at the moment is going into the elf army, but I did recently finish the ork warboss and took some decent photos. There are still a few rough bits here but he will probably stay in this form for a good while. Of course, just as he was finished I discovered the benefits of using a Big Mek so he's not actually seen action yet! 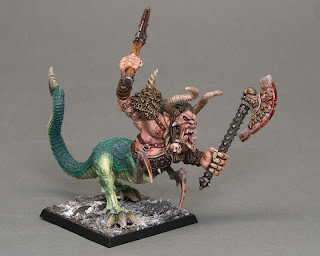 The other rustle in the forest was made this week by my first encounter with the new beastmen army. My regular opponent has collected and played beasts since we first gamed together, so I was looking forward to seeing how his army got on with the new rules. First thing I noticed was that it had shrank......his 2000 point force seemed considerably smaller than previous armies. It seems that most units have experienced a points raise, especially the characters. Next thing I noticed was that they were all huddled together in more compact units, not running wild and free (i.e. skirmishing) like the old army. Some units can still ambush, though in a slightly different fashion to the previous version. After the game, against my "weakest" fantasy army of Ogre Kingdoms, we decided it was roughly a draw and discussed the changes to the beastmen list. In summary, they have become less manouverable, remained about the same in shooting capability (that's virtually none still then), have possibly gained a little in combat effectiveness, lost considerably in magic due to their magic users being far more expensive and with more expensive casting rolls, suffered a little in psychology as base leadership of leaders is lower, seen a price rise on most units and ......well we had to stop and sob into our hands at this point. Of course, it's quite ridiculous to make a sensible judgement based on one game and we have not given up hope just yet. The beastmen still have to face my dwarfs, my high elves and my upcoming wood elves, not to mention the chaos army, after which we will have a better idea, though I shudder to think how they will cope with these more effective armies. Unless we are missing something, it does seem that the book was thrown together with little thought to effectiveness or even background. Perhaps the upcoming 8th edition will address some of these concerns, but if they do then I think we can look forward to some fairly radical changes to the way the game plays! Anyway, let's end the post on a diffferent note. A dozen brightly garbed elves leaping for joy at the castration of their enemies (oops, sorry beastmen players). "Err boss, I fink I we is goin da wrong way." That's what the little grot is probably shouting. After playing for about a year with basically a chimera minus the turret, I got my act together and bashed together this looted wagon. My original idea was to make it magnetised, allowing me to swap options, but as it took me this long to get this far I decided to just glue it all together and hope for the best. It's got a nice mix of ramshackle and solid, slightly more robust than a trukk. The skorcha is something that I haven't really used much, but I just love the little grot in the turret so decided it was a must. The passengers will usually be burna boyz, so there's going to be some serious pyrotechnics involved. After the recent game I realised that I had a few holes in my army, due to re-arming units and never really finishing the burna boyz squad. So over the weekend I decided to get together some big shootas. The two in the centre are meks, they will travel in a looted wagon with the burna boyz. 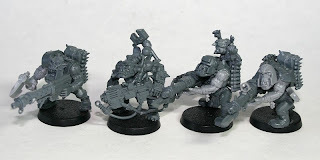 Each has on oiler grot strapped to his back, though this is a bit hard to see in the photo. One has a mega blaster, one has a big shoota, hopefully that will give me an option or two when the burnas are out of range. The other two boyz are armed with big shootas. The one on the right will probably be seconded into the 'ard boyz squad, while the one on the left is destined for the slugga boyz squad - he is well 'ard, toting his big shoota with just one hand, maybe I should rethink which squads they belong to! I did toy with the idea of him resting his barrel on an unfortunate grot's head, but it didn't really come together. I have been having more thoughts on the composition of the army, the main problem being that every time I browse the book I think virtually every choice would make a nice painting project and/or add an amusing/useful option to the army. And that's before the new ork releases in the spring. It's little wonder that GW give so much love to the greenskins if I think like a typical ork gamer, they must sell figures by the wagon load. I didn't have high hopes for the tankbustas' first game, for two reasons. The main reason (and this is obviously the one that's the most scientific) is that newly painted troops always seem to die a horrible death in their first outing. The tankbustas are currently half painted, but still I was nervous. The second reason I doubted was that 99% of commentary by ork players on various forums is that they are sub-standard and should be lootas instead. So how did their first game progress? They started the game in a looted wagon, 10 of them, with a big mek along for the ride. His kustom force field deflected a few shots but by the end of the first turn the wagon was immobilised. The tankbustas jumped out, the big mek stayed in the wagon, muttering to himself as he whacked a few pipes with his uge spanna. The bustas ran up a hill, hoping to get line of sight on either of the 2 Tau vehicles floating around. The big Hammerhead seemed a very tempting prospect. But their chance for glory was foiled by a pair of deffkoptas, which zipped out from behind a rocky outcrop and, with a very lucky shot, destroyed the hammerhead! All the boyz cheered, except the bustas of course, they made a mental note to target practise on the koptas when they got back to camp (if mental notes are possible in those thick green heads). In a way it was a blessing, there was now less thinking to be done, there was only one possible target to aim at. The devilfish was side on too, even the bustas could hit that! Well, 2 out of 9 managed a hit, and a cheer went up as the thing exploded and klunked down on to the ground. The tankbustas had their first kill! As for the rest of the game, they were free to target at will. A pair of broadside suits were next in their sights, and two turns later they had been destroyed. As the game came to a finish, they turned their attention to the Tau general, again in a battlesuit. Obviously the shooting practise throughout the game had paid off, as 4 out of 8 rockets slammed home, blowing the Tau commander away. A very satisfying debut for the bustas, quite possibly the best first game ever for a newly painted unit. Though, as they are only half painted, maybe it doesn't count. I did feel a bit sorry for the bomb squigs, deprived of any targets very early in the game. Perhaps next game, they will see some action. And I have grave doubts about how celebrations back at camp will turn out, those kopta pilots are in for a rough ride! I have had this character in a partly painted state for about a year, so I was quite glad to finish him off. I am still amazed by the detail of the sculpt, for a starter set figure it takes some beating! I turned the head to look along the power klaw rather than straight ahead, and I added a little trophy rack. The painting standard is similar to my mobs, though I spent a little bit more time on highlighting and touching up details, adding check patterns, etc. Finally managed to get a game over the weekend, after a long break over the Christmas holiday. I dug out my orks to face their most hated enemies, the Tau - they hate them because they don't fight proppa, hidin and shootin and runnin away. It was a good game and it forced me to dig out my ork box. This is full of bits and half-started (and half-hearted) projects just crying out to be finished, which is exactly what I did. I now have a unit of tankbustas to add to my army, that should give those Tau vehicles something else to worry about. The squad is based around the metal figures, with some additions from plastic troops. The plastics are handy because they can easily be made into more active poses, the metal figures tend to be walking and carrying their rokkit launchas. I just need a boss pole for the nob, because I can't imagine them escaping considerable fire power from the enemy, especially if they get lucky early in the game and take out a hammerhead. Now that would be a debut to remember. My painting has suffered a little recently as the midwinter break seemed to sap my enthusiasm. So my efforts on the elf army has reduced considerably, the result being that I have painted just one elf spellsinger in the past few weeks. In the picture she is accompanied by the high elf mage I painted a few weeks ago. I'm not sure what I will paint in the army next. I'm just hoping that as the temperature warms my efforts will similarly increase!